NEW YORK - The Oakland Athletics have won the rights to negotiate exclusively with right-hander Hisashi Iwakuma, Major League Baseball announced Monday. 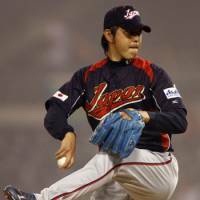 The Tohoku Rakuten Golden Eagles informed the league that they accepted the highest bid and the Athletics now have 30 days to sign the 29-year-old to a major or minor league contract. “The Oakaland A’s are excited to have our bid for Hisashi Iwakuma accepted by the Rakuten Golden Eagles,” the team said in a statement. The bid amount was not disclosed. Iwakuma entered the posting system last week and the 30 major league teams had until Friday to submit sealed bids for the exclusive right to negotiate a contract, upon approval of the price by Rakuten. “For now, I have taken the first step forward. The only thing I can hope for is that the negotiation goes smoothly,” Iwakuma said. If the deal materializes, Iwakuma would become the first since three players, including Boston Red Sox right-hander Daisuke Matsuzaka, used the posting system to move to the majors in the 2006 offseason. A Rakuten source told Kyodo News the bid amount was higher than expected, but the Seattle Mariners and Texas Rangers were also mentioned as possible bidders for the Pacific League All Star. Iwakuma went 10-9 with a 2.82 ERA for the last-place Eagles. 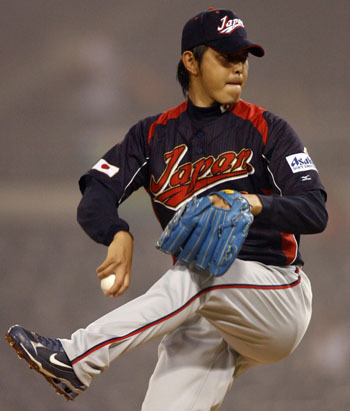 In 2008, he was named the Pacific League MVP and won the Sawamura Award after going 21-4 that year.